Join us on June 3 for our ONE DAY ONLY Spring Market. Seventeen local artisan and business vendors will be showcasing their handmade goods and one of a kind merchandise. This is an opportunity to connect personally with the people who love what they do and most importantly gives us an opportunity to shop small and shop local this spring! Retro Chique- Take a trip down memory lane by visiting us at the Spring Market. You will not be disappointed by our selection of retro and vintage one of a kind collectives. Daisy Thirteen- We aim to bring simple nature inspired designs to your home. Personalized gifts and accessories, designs to make you smile. White Rustic Woodworks- Building things rustic including tables, benches, book shelves, doors, coffee tables. Rustic inspiration at its finest! 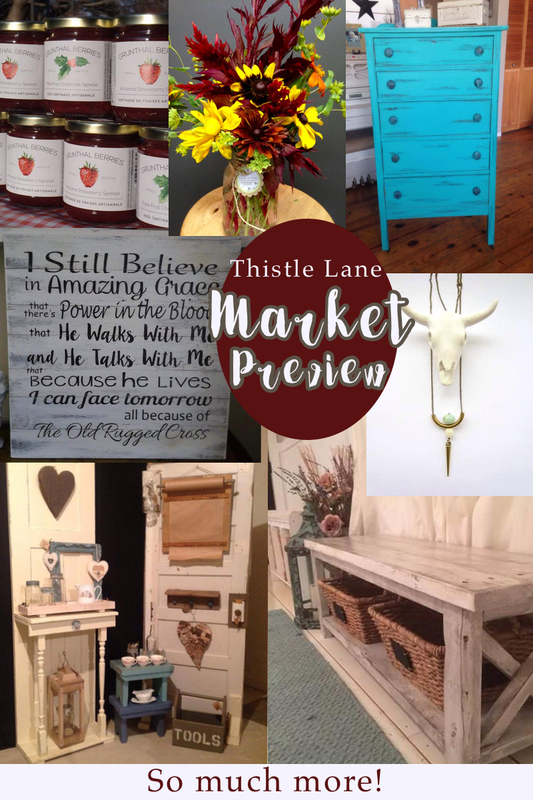 Handmade With Love- Repurposed furniture and handmade home decor, made from pallets as well as other recycled materials. Grunthal Berries- We grow our strawberries and then make a beautiful heritage jam. The jam tastes as fresh as the summer and is a little runny, just like grandmas recipe. Sage & Olivia- Unique, expressive, chic and always current. Uniquely handcrafted jewelry, designed with natural stones such as turquoise, jasper, agate, labradorite, coral and many more. Using vintage elements, chains, pearl, leather, and feathers the jewelry is ever evolving. Roosties Baby Muks- Re-purposed leather and fabric toddler footwear that is durable with barefoot like comfort. Then & Now Designs by Wanda- Then & now designs is taking something old and used then transforming it into something new and refreshing. Furniture, frames, blackboards, are some of the items of our home decor line. Artist Pivot- Arts and crafts, antiques and collectables. A variety of antiques in vintage and retro collectives. Flea markets dream with an assortment of new and gently used items. Old Church Bakery- Artisans Bread, sourdough cultures and long fermentation give this handmade baked bread its tremendous flavour. Oma’s Quilt Shop- This little country quilt shop offers fabric along with a variety of ready to sew quilt packages, hand made quilts, and much more. There will be something for everyone, no matter your style or sewing level, you will be inspired by the choice fabrics, and patterns. Annilynn’s Custom Made- An assortment of home decor items with a modern rustic touch, lanterns, wooden signage, vintage inspired chalkboards and much more are a few items that are being offered. The Home Workshop- Home, office and commercial design services including project management and furniture sales. Let us help you make your house a place you are proud to call home and a business a pure reflection of your brand and business goals. Connect with us at the Market to dream up how we can make your design dreams come to life. MA’s Creations- Inspirational signage for home and office, variety of styles and sizes. These beautiful signs are sure to leave a statement, expressing your inner thoughts. Thistle Lane Flowers- Field to Vase, locally grown flowers, bouquets will be sold weekly throughout the growing season, at various locations. 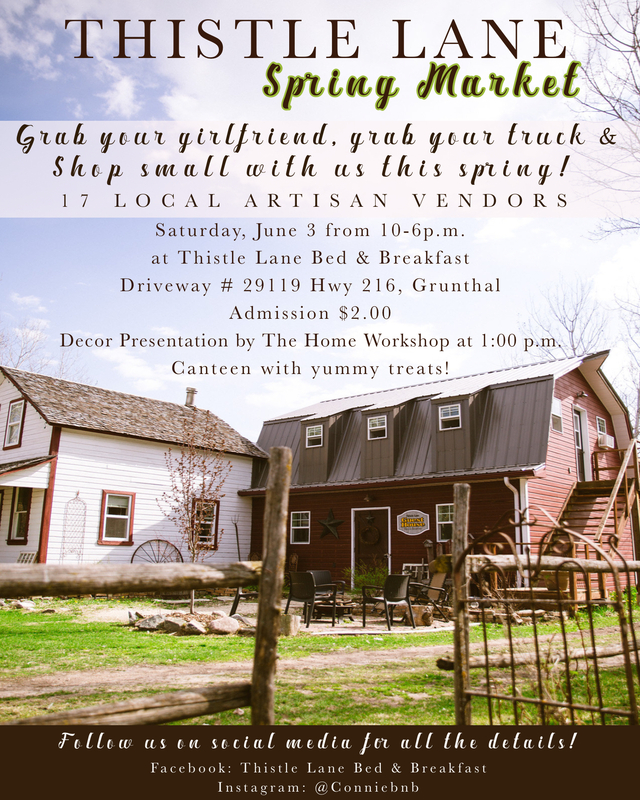 The venue at the spring market allows me a chance to show what we offer, our bouquets, hand tied as well as quart jars will be available for purchase. Boreal Tree Company- All things made from trees including birdhouses and wooden tapas boards. Dadirri Naturals- All natural alternatives for health and beauty at your fingertips. Quality ingredients and hand-crafted products that are great for your body and your world. Lehman’s Log Furniture- Showcasing and selling beautifully hand crafted stools, mirrors, coffee tables, dressers and more. All made from logs for a truly rustic look. We looking forward to seeing you. Follow us and our vendors on social media for sneak peaks, directions and so much more! Shop small and shop local with us this spring.